Leading Manufacturer and Supplier from Mumbai, our product range includes Hydraulic Hoses such as Industrial Hydraulic Hoses, Hydraulic Hose, High Pressure Hydraulic Hoses, Hydraulic Spiral Hose, Steel Wire Hoses, Hydraulic Brake Hoses and many more items. Hydraulic Spiral Hose offered can be made available by us in different inner and outer diameter options with choices of different bend radius as well as flange size options or as demanded by the customers. Here, our expertise lies in offering these in natural rubber finish as well as with reinforcement support using spiral steel wire/high strength fabric as demanded by the customers. Some of its features include superior abrasion resistant finish, high heat and ozone resistance and others. Innovation is our forte and we are engaged in manufacturing, exporting, wholesaling, trading and retailing a commendable range of Industrial Hydraulic Hoses. The wide spectrum of hoses is developed in adherence with the international quality standards under the guidance of experts. Resistance to chemical, corrosion and heat, these hoses are widely demanded by our customers. Backed by rich industry experience, we have been able to manufacture, export, wholesale, trade and retail Hydraulic Hose. Our offered hoses are manufactured with the help of modern machinery and technology that is installed at our infrastructure facility. Post-production, these hoses are checked thoroughly on various parameters to ensure flawlessness. 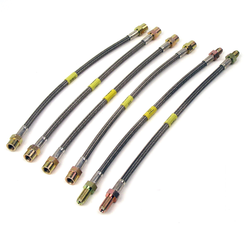 Creating new benchmarks in the industry as a manufacturer, exporter, wholesaler, trader and retailer, we are engaged in offering our clients with a commendable range of Hydraulic Brake Hoses. Used for various industrial applications, these hoses are developed by our experienced professionals in accordance with the international quality standards. Catering to the bulk demands of customers, we have attained their maximum satisfaction. 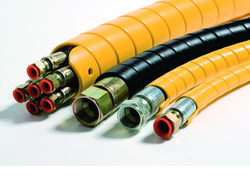 We manufacture and exporter of High Pressure Hydraulic Hoses. These products are required to transfer the general fluids and are used in various industrial sectors as well as other places. 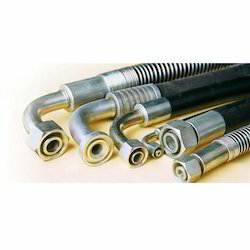 It is the hose that connects various components or tools in the most efficient way to a hydraulic system. 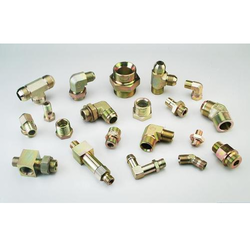 Steel Wire Hoses offered to come in the quality braided finish and feature high-performance EPDM inner tube as well as can be provided with support of nickel plated brass nuts as well as brass Inserts so as to provide for reliable functioning support. 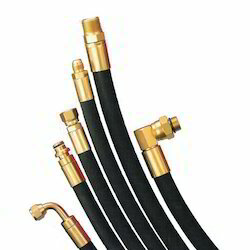 Further, these hoses comprise oil resistant synthetic rubber option that is also weather resistant thus making them provide for lasting service performance. Some of its features include high tensile strength; good wear resistant and anti-static finish; good bending property; capable of adapting to different working conditions.